The shields for U.S. 138 and 385 along Cedar Street allude to the street&apos;s former status as part of Colorado 51. Colorado 51 took a stair stepped route through Julesburg, navigating east from current Colorado 11 on 9th Street, to Chestnut Street south, 5th Street east and Cedar Street. U.S. 385 replaced Colorado 51 leading southeast from town. Photo taken 04/22/17. U.S. 385 is a very long route, serving the Great Plains between Big Bend National Park in Texas and Lead, South Dakota. The highway was created all at once, in 1959 as a major addition to the U.S. Highway System. Through Colorado, U.S. 385 enters the state paired with U.S. 287 in Comanche National Grassland. The routes divide at Lamar, with U.S. 385 traveling east briefly with U.S. 50, then turning north again at Granada and U.S. 400. From there, U.S. 385 passes through Cheyenne Wells, Burlington, Wray, Holyoke and Julesburg before leaving the Centennial State and entering Nebraska just south of Chappell. Leaving Julesburg, U.S. 385 turns southward from U.S. 138 at a diamond interchange to connect the town with Interstate 76. Photo taken 04/22/17. U.S. 385 spans the adjacent Union Pacific Railroad line, curves southwest to the South Platte River and meets Interstate 76 in 1.8 miles. Photo taken 04/22/17. This shield assembly stands immediately after the U.S. 385 southbound separation with U.S. 138 east and the adjacent UP Railroad underpass. Photo taken 09/05/05. Second photo taken 04/22/17. An incorrect mileage sign lists the distance to I-76 at three miles and Holyoke at 33 miles. The freeway lies 1.7 miles ahead while the Phillips County seat city center is 31.5 miles away. Photo taken 04/22/17. An off freeway rest area and tourist information center for Interstate 76 lies one mile ahead off U.S. 385. Photo taken 04/22/17. U.S. 385 south crosses the wide South Platte River over a series of bridges. Each span passes over a separate channel. Photo taken 04/22/17. Several gas stations and truck stops are located by the interchange joining U.S. 385 with Interstate 76, which is the last exit on I-76 eastbound before the freeway enters Nebraska. Photo taken 04/22/17. The Colorado State Welcome Center is located by the southwest quadrant of the Julesburg interchange. Photo taken 09/05/05. Southbound U.S. 385 reaches the westbound off-ramp for Interstate 76 west Sterling, Fort Morgan, Brush and Denver. Photo taken 04/22/17. Interstate 76 east to Big Springs, Nebraska opened to traffic in 1970. I-80 leads east from nearby to Ogallala while U.S. 385 continues south toward Wray and Burlington. Photo taken 09/05/05. North from the diamond interchange with I-76, U.S. 385 north leads two miles to Julesburg and 45 miles to Sidney, Nebraska. Photo taken 04/22/17. U.S. 385 expands briefly to five lanes through a collection of traveler services located north of Interstate 76. Photo taken 04/22/17. Narrowing to two lanes, U.S. 385 crosses over the South Platte River. The 1959-built bridges span four channels. Photos taken 04/22/17. U.S. 385 veers northeast from the South Platte River to connect with U.S. 138 outside Julesburg. Prior to 1988, the U.S. highway continued northwest along what is now County Road 32.7 to Cedar Street in Downtown. Photo taken 04/22/17. The 1988 realignment of U.S. 385 bypassed an at-grade crossing with the Union Pacific Railroad line, with an interchange built at U.S. 138. Photo taken 04/22/17. U.S. 138 ventures east along the South Platte River 10.7 miles to Big Spring, Nebraska. Photo taken 04/22/17. 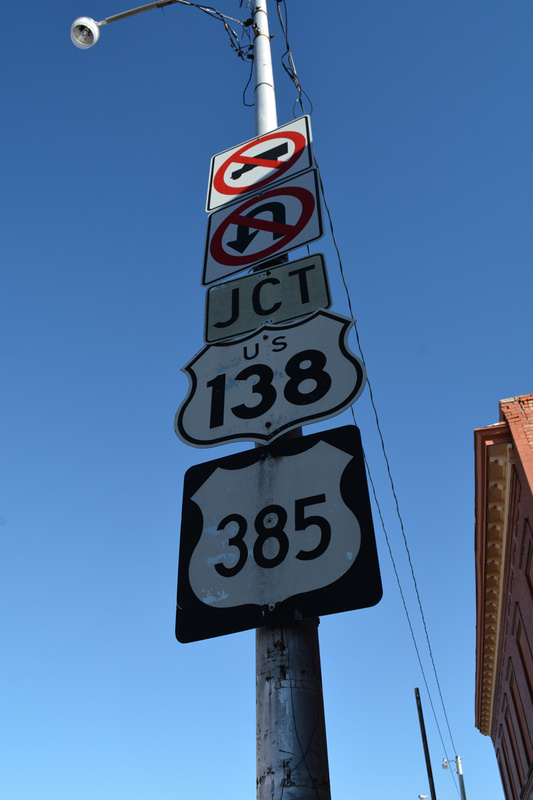 U.S. 138 west & 385 south combine for 3.8 miles through Julesburg to Julesburg Municipal Airport (7V8). Photo taken 04/22/17.